To any baseball fan, Nolan Ryan’s name still conjures up images of blistering 100-mile-per-hour fastballs and knee-buckling curveballs. During his 27-year career, “The Ryan Express” was named an eight-time All-Star and amassed seven no-hitters and more than 5,700 strikeouts—more than any other pitcher in major-league history. 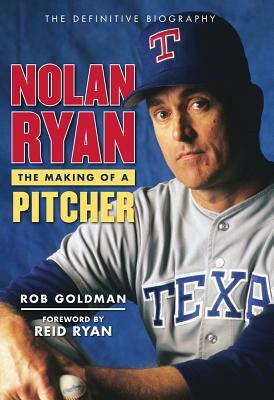 This comprehensive biography of Nolan Ryan follows the baseball legend’s journey from the start of his professional career in 1965 to his retirement in 1993. Hall of Famers, journeymen, clubhouse workers, coaches, and trainers offer their own unique take on Ryan in this book filled with never-before-told anecdotes and personal recollections and peppered with eyewitness accounts of his greatest games. In the pages of this history, readers will discover what made Nolan Ryan one of the most revered and respected athletes and citizens of his time. Rob Goldman was a batboy for the California Angels during the 1970s, when he first met Nolan Ryan. He is the author of "Once They Were Angels," a history of the Angels, and collaborated with former Angels outfielder Tim Salmon on his memoir "Always an Angel." He lives in Thousand Oaks, California. Reid Ryan, the eldest son of Nolan Ryan, was a minor league pitcher and co-founder of Ryan-Sanders Baseball. He is currently the president of the Houston Astros. He lives in Texas.